Where do I use my My Caribbean Holiday voucher code? The team at My Caribbean Holiday help tailor-make your dream Caribbean getaway with plenty of affordable flights and accommodation options in locations like Antigua, Aruba, the Bahamas, Barbados, the Cayman Islands, the Dominican Republic, Grenada, Jamaica, Cancun, Riviera Maya, St Kitts and Nevis, St Lucia, St Vincent and the Grenadines, Tobago and Turks and Caicos. Discover an array of holiday types at My Caribbean Holiday including all inclusive holidays, Caribbean Island hopping holidays, couples holidays, family holidays, group holidays, honeymoons, luxury holidays, single traveller holidays and multi-centre holidays. If you’re struggling to find a holiday right for you check out the inspire me section where there’s tons of information on destinations and holiday types. You can also get in touch with the travel experts themselves for information and guidance on your ideal getaway. If you’re shopping on a budget you can also check out the special offers section where there are tons of deals and discounts. 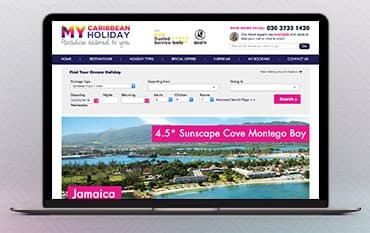 With so many different Caribbean Islands offering unique experiences, it's difficult to know which one to pick that’s why My Caribbean Holiday provide an ‘inspire me’ section in order to help you plan your perfect holiday. My Caribbean Holiday has put together some inspirational picks from their expert team as well as a travel blog for you to read at your leisure. Discover information and articles on the times of the year it’s best to visit the Caribbean, what activities you can enjoy while you’re there and what each location has to offer. With a combination of inspiration, travel picks and blog articles, you are sure to find your ideal Caribbean holiday destination in no time. My Caribbean Holidays have a great range of amazing deals available in their special offers section, all of which can provide you with fantastic savings on your next holiday to the Caribbean. On their special offers page, you can find a selection of their favourite deals to some of the best destinations the Caribbean has to offer. And with deposits starting from just £59pp there's never been a better time to book. Save up to 50% on locations like Antigua, Barbados, Jamaica and St Lucia and head off for a holiday of a lifetime on white sand and glistening sea beaches. Follow your own route between the idyllic island gems of the Caribbean with the Caribbean Island hopping holidays available at My Caribbean Holiday. With so many different island nations, traditions, cultures and cuisines to explore, the My Caribbean Holiday team can put together your own bespoke combination of Caribbean destinations and create the most enjoyable island hopping experience. Some islands such as St. Kitts and Nevis are only a quick boat ride between each other, while other trips combine the Windward Islands of Grenada or St Lucia with the more northerly island of Antigua, all of which are easily connected by a short flight, so whether you’re looking to just experience a new island for a day, or head off to a few new locations during your holiday, you can create the perfect itinerary for you and your holiday companions. In order to confirm a booking, a deposit of £200 per person or such other amount as notified to you (or full payment if booking within 71 days of departure) is required at the time of booking. The required deposit may vary given the type of service being booked and will be advised at the time of booking. Should you wish to cancel your holiday once it has been confirmed, the lead name must advise My Caribbean Holiday in writing immediately. Your notice of cancellation will take effect when it is received. The percentage cancellation charge detailed is calculated on the basis of the total cost payable by the person(s) cancelling excluding amendment charges. Amendment charges are not refundable in the event of the person(s) to whom they apply cancelling. My Caribbean Holiday’s team of travel experts tailor make luxury getaways in the Caribbean just for you. Whether you’re looking for a relaxing all-inclusive escape to Barbados, an active adventure in Antigua enjoying the plentiful diving and snorkelling spots or a lively holiday in Cancun, My Caribbean Holiday has it covered. Book online with peace of mind with fully bonded ATOL and ABTA financial protection, use a promo code from us in the process and cut the cost of your Caribbean getaway too. My Caribbean Holiday are preferred partners of leading airlines including Virgin Atlantic, British Airways and Thomas Cook Airlines, so you can rest assured that you’re booking with only the best. We are constantly on the hunt for Promo Codes for My Caribbean Holiday to help you with your money saving. Our experts check dozens of sites for secret codes including NHS discounts, student sites & social media channels saving you time & money!